Conditions like PCOD in females leads to unwanted hair growth on face, chin and other places. On the other hand sometimes hair on the chest or back of males can be an embarassment. Laser Hair Reduction at ARV Aesthetics, Skin & Laser Centre, Gurgaon is a painless alternative to waxing, shaving or plucking..
Now no more unwanted hair issues! Get smooth, hair free skin with Tender Skin Internationals Laser hair removal treatments. Complete relief from a lifetime stress of waxing, threading and hair removal creams. Complete absence of unwanted hair in public areas of our body is a matter of Self image for most women in our society. Laser Hair Reduction is a safe and effective method of hair reduction for most people. 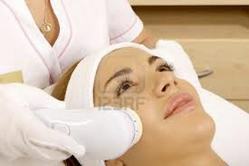 Laser Hair Reduction treatment is more effective with thick dark hair than it is with thin light hair. Lasers are specially suited for the reduction of unwanted hair and are a non-invasive method to disable the hair structure without damaging the surrounding area. Numerous hair follicles can be treated simultaneously allowing for rapid coverage of large areas with minimal discomfort. Get pain free reduction of hair which otherwise lets you go through mere stress of waxing or threading or electrolysis. - The laser produces a large beam of highly concentrated light (IPL), Laser (Diode). - The light/Laser emitted is well absorbed by the pigment located in the hair follicles (melanin). Skin solutions pune use (Candela , GentleYAG). Our staff are fully trained in a wide range of treatments, including laser hair removal, anti-wrinkl e treatment and more. For reduction of unwanted hair over face & body. 6-8 sessions are required at 2 months interval for satisfactory hair reduction. Done with 'Light Sheer Diode Laser'. Spot reduction essentially refers to reduction of fat from a particular area in the body. However, most people including fitness experts believe that it is a misguided view and it is impossible to reduce fat in a specific region by exercising that part of the body alone. On the contrary, the excess amount of fat in the entire body is lost as a result of diet and regular exercise.